Hello and happy Tuesday. It's time for another challenge at CASology. 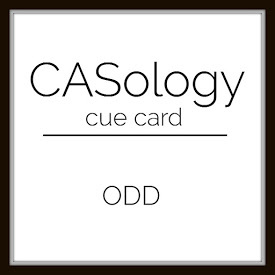 This week, our cue word is ODD. I immediately thought of odd numbers, and decided to pull out my ME Pandas. I stamped and fussy cut 3 pandas out of scrap paper, and then framed them in red. Now it's your turn. How does ODD inspire you? I hope you play along this week. Please remember to keep it Clean and Simple. Our Guest Designer is Natasha. Your Panda's are so cute, Joyce! Your B&W color palette framed with a pop of red is just perfect, too! LOVE this sweet card! Well aren't they a fun little dancing troupe!! This is adorable Joyce!! Adorable little guys, Joyce! What a sweet trio to bring some happy mail!